Employee benefits can be very important for quality of life. Without health insurance, a serious injury or illness could cost tens of thousands or even hundreds of thousands of dollars and possibly lead to bankruptcy. Without a retirement plan or significant private savings, many people simply may not be able to afford to retire because social security only replaces 36% of income for an average worker (Social Security Administration, 2008). 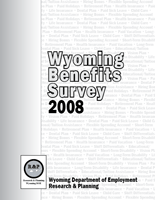 Employers have their own reasons for offering benefits. First, many employers provide benefits in order to compete for a limited supply of labor. Employers may also structure their benefits in order to reduce turnover (Harris, 2003). This is seen in waiting periods before employees can enroll in health insurance and in vesting periods for retirement benefits. Finally, compared to paying all compensation in the form of wages, there are tax advantages for employers who offer health insurance (Jones, 1997). In spite of these reasons, many employers don’t offer any benefits. Costs of health insurance have increased dramatically in recent years (U.S. Government Accountability Office, 2006). Some employees may already have health insurance or may not recognize a need for it. Setting up and operating a program of employee benefits may include high fixed costs, which might be especially burdensome to small employers.